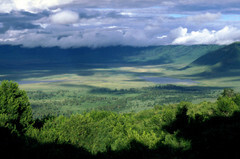 The Ngorongoro Crater is the world’s largest unbroken, unflooded volcanic caldera and the closest you may come to the Garden of Eden. What’s more, and because of its naturally occurring borders, it houses an amazing array of plant and animal life. There is even speculation that life on Earth originated from the extinct volcano. There are lodges and safaris touring the crater, and if you can get your hands on a ticket to East Africa, I’m sure you’ll find your money well spent. So, if you want to get up close and personal with zebras, black rhinos, and wildebeest, consider Ngorongoro to be nature’s drive-thru safari.